Imagine all the excitement of a Disney theme park at sea and you have the premise for a fantastic Disney cruise from Miami vacation experience. As with all cruises from Miami, a Disney cruise can offer you different itineraries, taking you to exciting ports near and far. This year Disney has a 14 night repositioning trip and 2, 4 or 5 night outings to various destinations all leaving from this popular eastern Florida port. Your Disney cruise from Miami brings you the best of family cruising, including many of your favourite characters, great dining opportunities and plenty of things to do onboard for everyone in your party. Disney themed guest rooms with all the amenities you can think of and roomy enough for your whole family are at the heart of the experience, and even if you have an inside cabin, you get some Disney fun with a porthole shaped monitor featuring fish and surprise characters swimming by. A Bahamas cruise from Miami aboard the beautiful Disney Wonder, takes you to Key West, Nassau and Castaway Cay, their private island adventure exclusively for guests on their cruises to enjoy. Swim with stingrays, hunt for buried treasure on the ocean floor or relax on the beach and enjoy a Disney style barbeque while sipping a frozen drink, the choice is yours and the fun is pure Disney. For a different Disney cruise from Miami, check out the aforementioned repositioning cruise, where you can take in the wonders of the ship while enjoying stops in Castaway Cay and Colombia before venturing through the Panama Canal. Then it’s on to Puerto Vallarta and Cabo San Lucas before heading to the end stop of Los Angeles. This cruise combines the Bahamas with Central America and the best ports of call in Mexico on a once-only offering, cruising May 6th, 2013. Disney cruise vacations are always a great vacation idea for the whole family, and also offer two different 5 night options to the Western Caribbean, one that boasts stops in Grand Cayman and Cozumel and the other that has stops in Cozumel and Castaway Cay before heading back to the beaches of Miami. 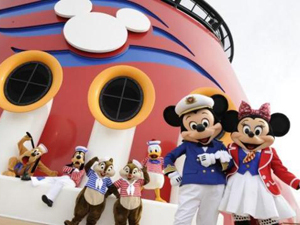 For a shorter cruise of 3 nights, their Nassau and Key West cruise that departs on November 6th, 2013 is a great Disney cruise deal with prices starting at just $450 per person. If you’d prefer a Disney cruise from Miami that doesn’t cruise to anywhere, their 2 nights away just cruising a lazy loop in the Atlantic offers you plenty of time to take in the ship from bow to stern and have an amazing holiday at sea in the process. This cruise makes a great mini escape from the everyday and a fun way to see if cruising is for you. If you are looking for a vacation that blends good old fashioned family fun with the dream ships of the line, then a Disney cruise from Miami is sure to make all your dreams come true.